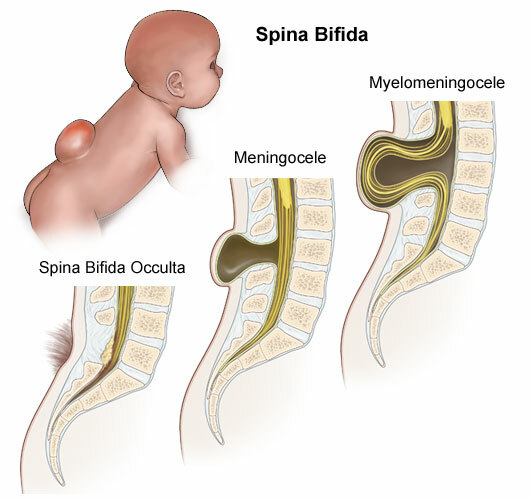 Spina bifida is a neural tube defect. The neural tube, during development, is a structure in the embryo that becomes the brain and spinal cord (and their enclosing tissues). The neural tube is supposed to close within 28 days of conception. If it does not close properly, spinal cord and backbone defects occur.1 One way to prevent 70% of the spina bifida cases is to take 400 mcg of folic acid every day, before becoming pregnant. Those women with a family history, or prior pregnancy resulting in this disorder, should consider higher doses of folic acid with their caregiver.2 Spina bifida means, literally, “open spine”. While it is suggested that there are some genes involved, other possible causes include high fever during pregnancy, or use of the epileptic medication, valproic acid.